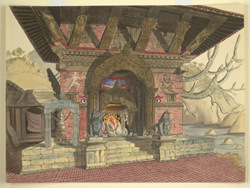 Watercolour of the Jal Binayak temple at Chobar in Nepal, by Henry Ambrose Oldfield (1822-1871), dated July 1857. The image is inscribed on the reverse: 'Temple of 'Ganese' (Beegna Bunaik) on the right bank of the Baghmutty river, near Chobbar. July 1857'. Dr Oldfield was Residency Surgeon at Kathmandu from 1850-1863. After his death his family published his two volume 'Sketches from Nipal, Historical and Descriptive...' (1880), which described life in the court of the Maharajah Jung Bahadur and also contained descriptions of Buddhist architecture, together with illustrations from Oldfield's own drawings. The Jal Binayak temple is dedicated to Ganesha, the God of Wisdom, who is venerated by Buddhists as well as Hindus. Ganesha's help is often called upon at the commencement of all important religious or domestic undertakings and his image is usually placed close to the entrance to a temple. This temple dates from 1602, but there is evidence to suggest that there was an earlier temple on the same spot. Ganesha is usually represented by an elephant's head, yet here he is represented by a large rock, as can be seen in the centre of this drawing.